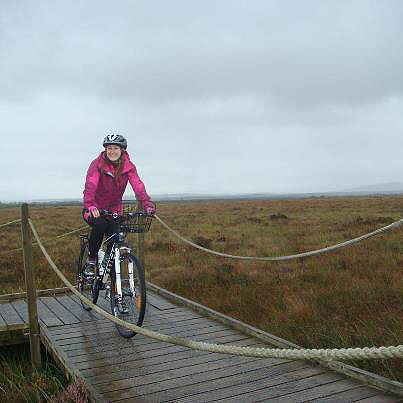 Annie completed her Pedal for Peat’s Sake Challenge in October 2012. To celebrate she gave a talk in the Patagonia Store in Exchequer Street Dublin on the 15th October. IPCC friends of the bogs and staff from Patagonia and IPCC were present to hear of her adventures. 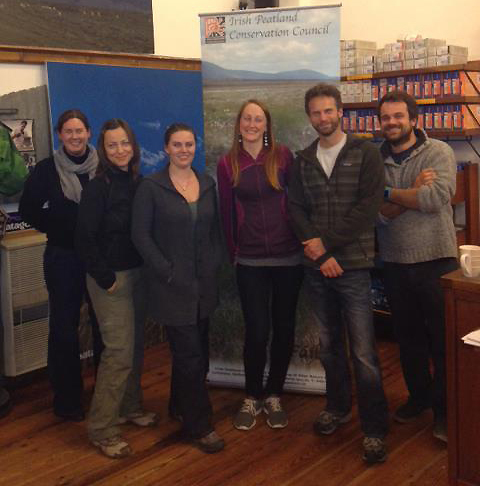 IPCC would like to thank Annie for raising awareness about Irish peatlands through this project. She visited six bogs as shown on the attached map. Here is a selection of photographs of Annie Capell as she cycles her way around the bogs of Ireland, raising awareness and donations for the IPCC’s Save the Bogs Campaign. Annie has a Peatland Passport which is being stamped at each bog she visits. IPCC hope to encourage other visitors to Ireland to use the Peatland passport in years to come. Annie Capell on Lodge Bog in the Bog of Allen, Co. Kildare as she begins her Pedal for Peat’s Sake Challenge on the 20th September 2012 (Photo: T. O’Corcora). 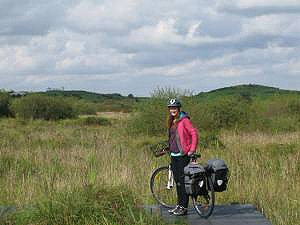 Annie Capell on Fenor Bog in Co. Waterford on the 22nd September 2012 during her Pedal for Peat’s Sake Challenge (Photo: R. Byrne). 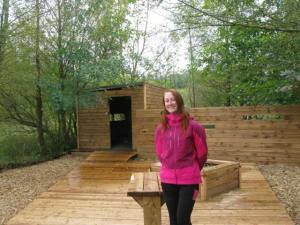 Annie exploring the education centre at Gristan Bog, Co. Limerick on 25th September 2012 (Photo: Amanda). 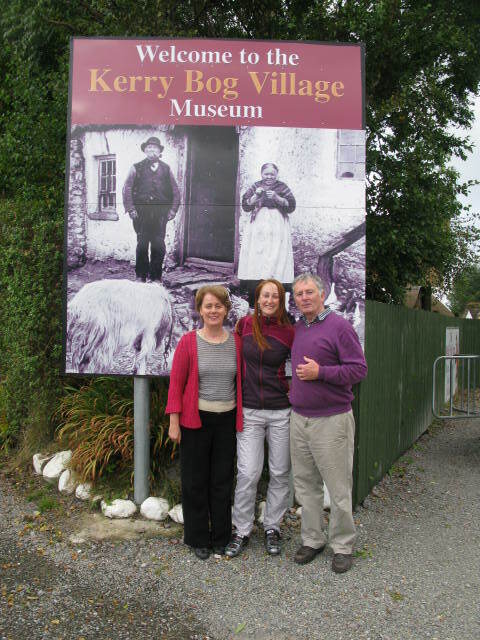 Annie with Mr and Mrs John Mulvihill at the Kerry Bog Village in Glenbeigh on the Ring of Kerry. 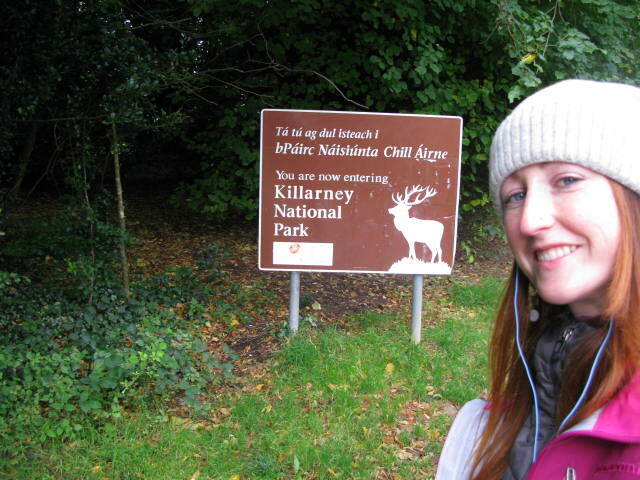 Annie at Killarney National Park, Co. Kerry. 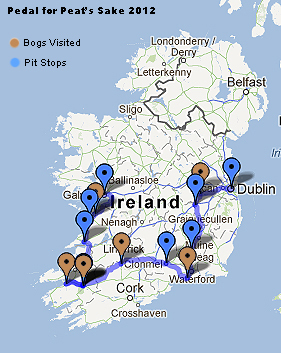 This entry was posted in News and tagged Bogs, Conservation, fundraising, IPCC, Ireland. Bookmark the permalink.